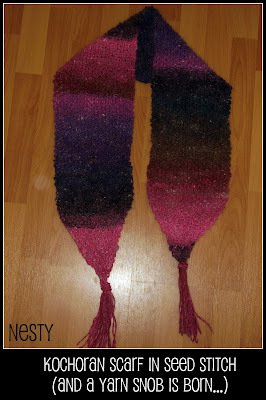 Nesty: My Evolution of Knit + A Blogoversary! My Evolution of Knit + A Blogoversary! This is a rather big week for Nesty. Tomorrow, January 18, is my first "Blogoversary." So I'd like to take a moment to thank all of my wonderful readers for a really great year. Each comment and new follower made my heart jump with excitement and motivated me to continue writing. As time passed and features, mentions, and awards began to arrive in my inbox, I was beyond thrilled at your recognition of my work. When I started blogging a year ago I really didn't know much about the community that exists here in Blogland. I've met some truly wonderful people and through your writing I've become connected to your lives. I have read posts with excitement to see if someone's baby has arrived or if their surgery went well. I've grown misty when sadness has visited some of you. 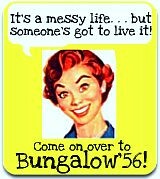 I've commiserated and lent advice, especially with regards to relocation. And on the occasions when a favorite blogger decides to leave blogging, or just plain disappears, I've felt their absence and missed them. It's been an incredible and rewarding time, and I'm looking forward to what the next year will bring. And so, whether you've been following since the beginning or just joined up, Thank You so much!!! Those of you who have been following since the beginning may recall my adventures in learning to knit. Anyone out there remember this? Just yikes! But, as I mention in the original post, my goal with this project was to actually stick with it and get it cast off, no matter how ugly the finished project was. This scarf could really be a cautionary tale of all the things you shouldn't do, but I'm still really proud of it because once it was finished I knew how to cast on, knit, perl, and cast off. I was ready to go. Bring on the projects! For my next few projects I concentrated on items that would help me learn the basics of knitting. The turquoise scarf is knit in a basket weave pattern (a basket weave pattern requires you to alternate knitting and perling at regular intervals.) I also got to make a fringe! The watch cap was my first project on a round needle, and although it was far too small to wear, it got me very excited about projects that could be knit "in the round." And so, for the first time, I searched online for a pattern and found the pattern for the cute red hat. 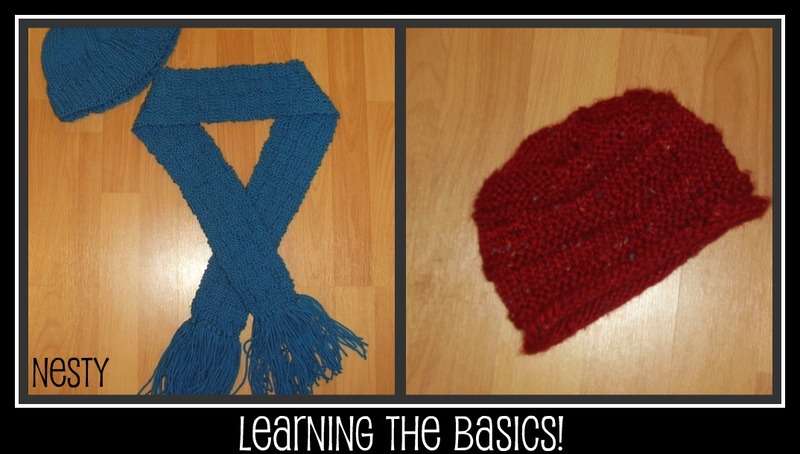 The cute red hat is a lesson in why it is important to pay attention to the type of yarn and needle size the pattern calls for. Yet again, my hat was too small, however it was the first item I looked at where my mistakes weren't the first things I saw. After the socks, I never really looked back. 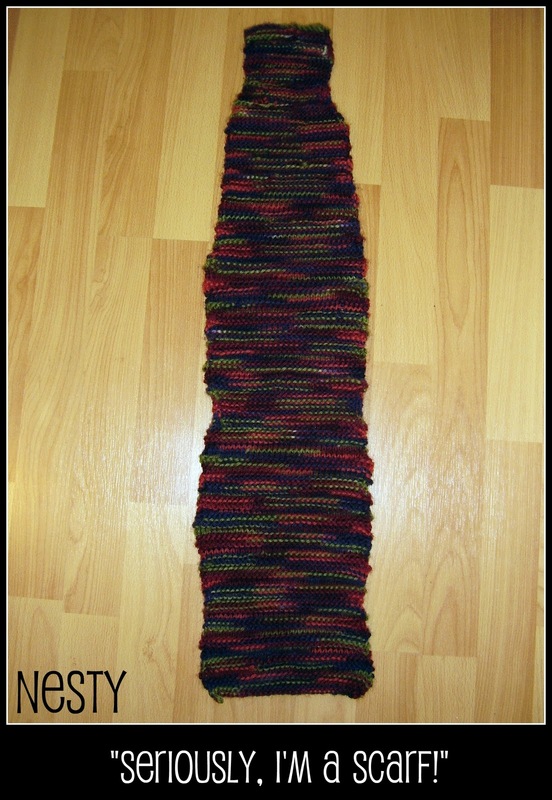 The past few months I've been knitting up a storm. I came up with a "collection" of items that I gave for Christmas gifts. It was so fun embracing the "design" part of knitting; adjusting a pattern, experimenting with colour and fibre combinations, and even making up names for my garments. One of my favorite items to knit (besides socks!) are hobo mitts. These go by several names but they are basically fingerless mittens. I made these for my niece, my sisters and my sister in law; each pair had a unique twist to them that made them "one of a kind." I really fell in love with these cuties and they almost didn't make it into the gift box! At a craft show, I bartered two Tiny Totes for a skein of chocolate brown yarn (I was bored and had forgotten my knitting). While sitting at my table I played around with the yarn and decided that they would make adorable hobo mitts. The yarn is actually an acrylic nylon blend; compared to the alpaca and sheeps' wool of the other projects I made it didn't sound as nice but it knit up into a delightfully warm and snuggly mitt. 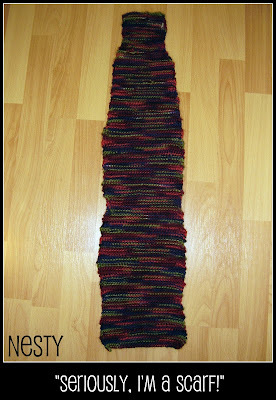 To give it a pop of colour (and a bit of snob factor) I added a cherry pink stripe in Baby Bamboo yarn. 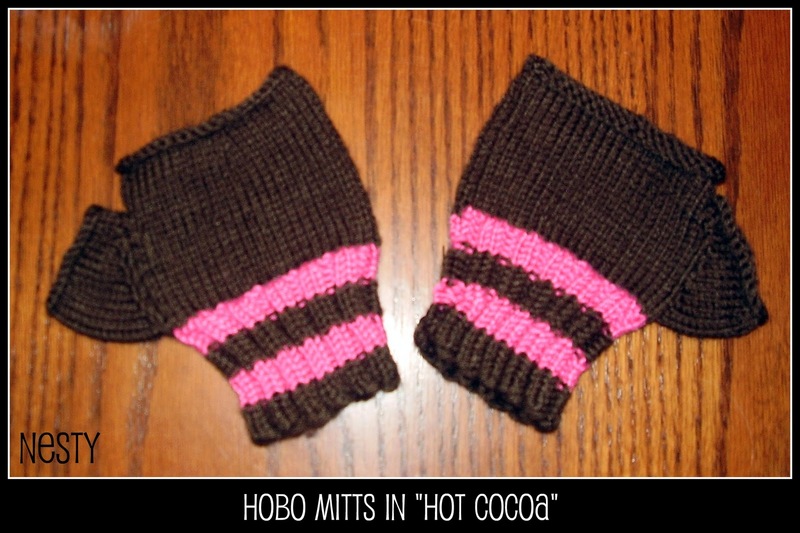 For all my hobo mitt projects I followed essentially the same pattern, but made a few adjustments. For the Hot Cocoa mitt I wanted a snug fit, so I decreased the last few rows on both the hand and the thumb. The fibre choices (synthetic and plant based) for this project would make it ideal for someone with wool allergies or ethical concerns. So there you have it, my evolution of knit! I'll be back on Wednesday with a post about severe winter weather conditions and what all those warnings actually mean. And on Friday I'll be sharing one of my all-time favorite recipes, and it's awesome; vegetarian, high fibre, cheap and low fat! Oh, and absolutely delicious!! See you then! Great post, and very,very cute mitts!!! I'll have to get that pattern. Oh!! And Happy Blogoverary!! I can't believe it's been a year!!! Congratulations on your blogoversary! woohoo! oh that scarf almost made me fall off my chair, but what a huge improvement you made. But you know what, when I was first learning to knitt, I tried to make a purse but it ended up looking like woman's underwear. 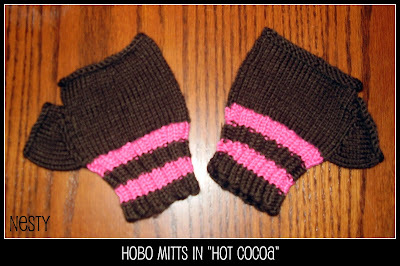 Love the hot cocoa mitts, very cute. Yes, it's sad when our blog friends go missing. I too lost a friend recently, I don't know what happened to her, she just deleted her blog. Take care Nesty and keep warm.